Move the rack to lowest position. Pat cut potatoes with paper towels to remove excess moisture. Place cut potatoes in a large microwave safe bowl and cover bowl tightly with plastic wrap. Pour 3 tablespoons olive oil onto a rimmed baking sheet and place the baking sheet in the hot oven for 5 to 7 minutes, until the oil is just beginning to smoke. In the meantime, place 1 tablespoon olive oil in the same large bowl you used to microwave the cut potatoes. Add the cornstarch and salt and stir to combine. Add the cut potatoes and toss gently until potatoes are coated. Remove the baking sheet with extremely hot oil from the oven. Using tongs, carefully arrange the potatoes in a single layer on the baking sheet. Return the baking sheet to the oven and bake for 15 minutes. 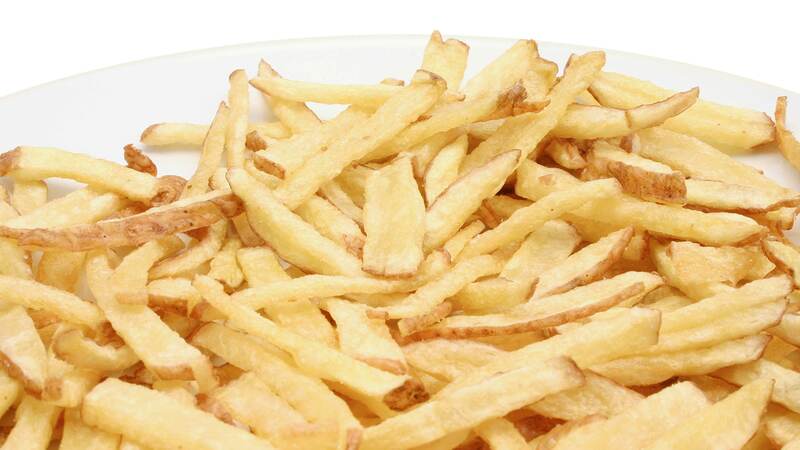 Flip the fries and continue baking for 10 to 15 minutes longer until fries are golden brown. Remove the baking sheet from the oven and transfer the baked french fries to paper towels to blot to remove excess oil. Serve crispy french fries while they're nice and hot!